On March 2, 2010, the Secretary of Defense directed the Honorable Jeh Charles Johnson, General Counsel of the Department of Defense, and General Carter F. Ham, Commander, U.S. Army Europe, to “stand up an intra-Department, inter-Service working group to conduct a comprehensive review of the issues associated with a repeal of the [Don’t Ask, Don’t Tell] law.” The Secretary’s Terms of Reference required two deliverables: 1) a Report containing the Co-Chairs’ assessment and recommendations; and 2) “a plan of action to support the implementation of a repeal of the law.” This is that plan. The Support Plan for Implementation was written in close collaboration with the Office of the Under Secretary of Defense for Personnel and Readiness (OUSD(P&R)) and anticipates key elements of a successful implementation. It is based on the assessment and recommendations contained in the Co-Chairs’ Report. Because issues associated with repeal of 10 U.S.C. 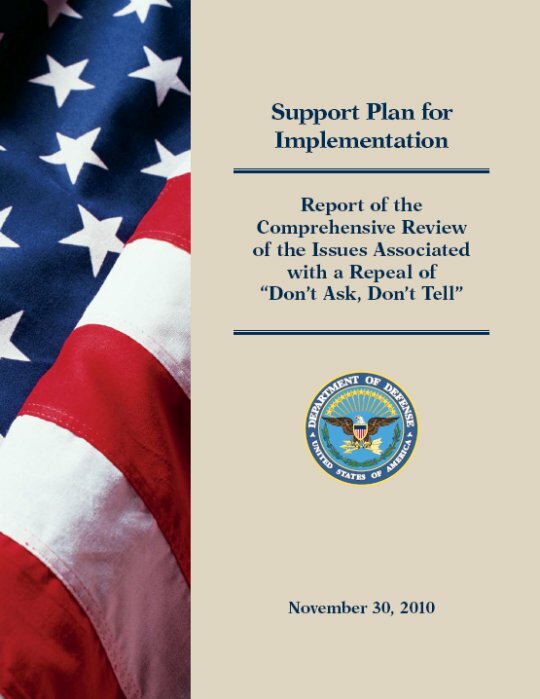 § 654 (commonly known as the “Don’t Ask, Don’t Tell” law) are subject to a shifting legislative and legal landscape, in order to implement any change in law or policy successfully the Department of Defense and the Services may need to deviate from some recommendations found in this Support Plan. Until such time as Congress may act to repeal Don’t Ask, Don’t Tell, the Support Plan and subsequent related work by OUSD(P&R) and the Services serve as contingency plans that will assist the Department of Defense in preparing for a repeal, should it indeed occur. This plan is designed to support each of the Service Training Commands in developing training materials in the traditions and requirements of their respective Service. This plan does not mandate any activity, nor does it contain actual training documents or specific lesson plans; the body of the plan outlines the key policies affected if repeal occurs, while the appendices provide sample tools and information that Services may find useful in designing their training and communication materials. Planning now will allow the Department of Defense to better anticipate repeal-related issues and costs and will help to ensure that any post-repeal transition occurs with maximum efficiency and minimum disruption to a force engaged in combat operations and other demanding military activities around the globe. The Support Plan provides a basis upon which OUSD(P&R) and the Services can build executable, DoD-wide and Service-specific plans in the event of repeal. The Support Plan links the Co-Chairs’ assessment and recommendations to OUSD(P&R) planning processes, thereby enabling a smooth transition from the Working Group to OUSD(P&R) now that the Working Group has completed its effort. The Support Plan relies heavily on the research conducted by the various teams within the Working Group, survey data, engagements with the force, and the white papers produced by the Service academies. The Support Plan also builds on best practices gleaned from other relevant military and academic publications, the updated RAND study, and various Working Group interactions with and information provided by academic and military groups and other interested organizations. Based on engagements with the force and the assessment of the impact of repeal, the Working Group distills the key message for risk mitigation and successful implementation to Leadership-Professionalism-Respect. A clear focus on Leadership-Professionalism-Respect will enable any change in policy to be executed with minimal disruption to the force. The Support Plan addresses both short-term preparation for and execution of a repeal of 10 U.S.C. § 654, as well as long-term sustainment. The Support Plan breaks the implementation process into three stages, each covered in a separate section: “pre-repeal” (section III), “implementation” (section IV), and “sustainment” (section V). The pre-repeal stage would begin at the direction of the Secretary of Defense, prior to the enactment of any legislation that would bring about repeal of the law. During this stage, the Department of Defense and the Services would continue to review existing policies and issuances affected by repeal, and prepare new or revised issuances based on the recommendations in the Working Group’s report, should the Secretary approve those recommendations. The Department of Defense and the Services would also develop education and training materials and communications plans that would be used in the implementation stage. Because the pre-repeal stage assumes that no repeal legislation has yet been passed by Congress, it would not be appropriate to commence education and training programs for the force during this stage. The implementation stage would begin upon the enactment of legislation bringing about repeal of the law, should such legislation be enacted. This stage would last until some point after the effective date of repeal, once the roll-out of new policies has been completed. During the implementation stage, prior to the effective date of repeal, the Department of Defense and the Services would finalize the policy revisions started during the pre-repeal stage. Education and training programs necessary to prepare the force for repeal and to communicate the upcoming policy changes would then be executed. Upon the effective date of repeal, the Department of Defense and the Services would put any new or revised policies into effect. Finally, the sustainment stage would begin at some point after the new policies have been put into effect, and would be ongoing. The sustainment stage would involve follow-on review and ongoing monitoring of implementation of repeal, in order to make adjustments to implementation based on the experiences of the Department of Defense and the Services to that point. While the Support Plan separates these stages into distinct sections for ease of discussion, in execution the precise boundaries between them may not so easily be discerned. The Support Plan for Implementation is written at a time when the legislative and legal landscape regarding Don’t Ask, Don’t Tell is in flux. As of this writing, legislation that would allow for repeal of 10 U.S.C. § 654 is under consideration by the 111th Congress, but has not been enacted into law. The Don’t Ask, Don’t Tell law and policy are also the subject of ongoing constitutional challenge in Federal court. In general, this Support Plan is written with the awareness that the Department of Defense and the Services may need to deviate from its recommendations depending on legislative and legal outcomes that are unknown as of this writing. Furthermore, the Department of Defense and the Services must be mindful that, prior to the effective date of a repeal, 10 U.S.C. § 654 and associated policies remain in effect, and, as such, homosexual conduct remains a basis for separation from military service. Included in this Support Plan is a review of many of the materials the Working Group considered in developing this plan (in particular, the white papers provided by the Service academies). This literature review is provided in section II. The Support Plan also contains four appendices that provide sample tools that may be useful for the Department of Defense and the Services in developing and executing education and training related to repeal. Appendix A contains recommended talking points. Appendix B lays out the Working Group’s recommended education and training framework, including learning objectives for specific policy areas. Appendix C is a recommended leadership implementation guide to assist leaders at all levels in addressing practical issues associated with repeal. Appendix D provides a set of frequently asked questions (FAQs) and answers regarding repeal, as well as training vignettes covering a number of the Working Group’s policy recommendations. Finally, Appendix E suggests some strategies for undertaking follow-on review and ongoing monitoring of implementation of repeal. 1 For instance, under the legislation currently contained in the House of Representatives version (H.R. 5136) and Senate Armed Services Committee version (S. 3454) of the National Defense Authorization Act for 2011, repeal would only take effect 60 days after the delivery of a certification signed by the President, Secretary of Defense, and Chairman of the Joint Chiefs of Staff. If such legislation were to pass in the near future, much of the development of policies and of education and training materials described in the "pre-repeal" stage would likely occur after the passage of the legislation; these activities would then blend into the finalization of policy changes and the execution of education and training described in the "implementation" stage, both of which would likely occur prior to certification. 2 1 U.S.C. § 7.